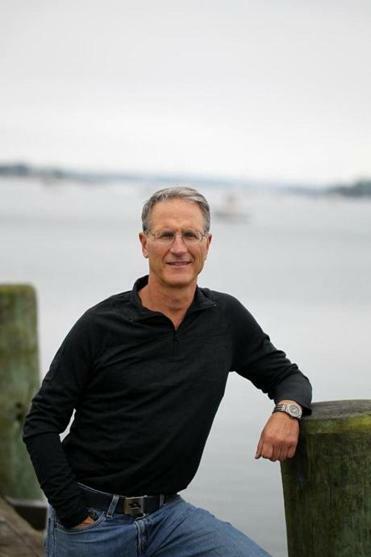 The Plymouth author’s fifth thriller has hit the bookshelves. My very first survival book, about a rescue during the Blizzard of ’78, made my hair stand up. I loved the detective piece of trying to put these puzzles together of WHAT HAPPENED AND HOW THEY SURVIVED. I’m not a sailor; I don’t get into the technical details. My mantra is: Keep it fast-paced. There are hundreds of search-and-rescue cases a year — what I’m looking for are twists and turns, something unusual. A Storm Too Soon, my latest, came about because I saw one picture of AN 80-FOOT WAVE WITH A LITTLE LIFE RAFT in it. I was able to track down the Coastie who took the picture. He started telling me the story, and I was hooked. This was the first time I’d come across an incident where the rescue swimmer got into trouble. Four boats were caught in this 2007 [Gulf Stream] storm; one, sadly, had FOUR RHODE ISLANDERS WHO DISAPPEARED. The weather forecasts were so far off; these people got blindsided. I didn’t think another rescue would be this incredible. Then the HMS Bounty went down in Hurricane Sandy; a coauthor and I are doing that book next. I’ve interviewed 75 people who shouldn’t be on the planet. A lot of them made it because of their decision making, so I put that into a business program called Survival Lessons. They wouldn’t waste time thinking, “How did I get in this jam?” They KEPT GOING TO THE NOW, trying to stay positive.